The Carolina Yacht club has a fabulous shore front facility to host any regatta. E-Scow sailors will be the lucky ones to enjoy the best there is to offer on March 28-30 (Fri-Sun). While writing this sitting in Wisconsin it is the end of February and the temperatures for the next week are well below zero. One of the coldest winters ever. You deserve a break - take the trip to Charleston SC. It is not too late to make your plans. Maybe all of your regular crew can't make it, but there are a ton of great E-Scow crew who would love to be going to sunny skies and warm temperatures. Which brings me to the second article below - easily search and find NCESA members on the web! You can find this information easily on the website and you do not have to be logged in to do it. The 'Member Info' menu has a sub-menu 'Member Directory' and if you click on that you will see the Member Directory page with search options. 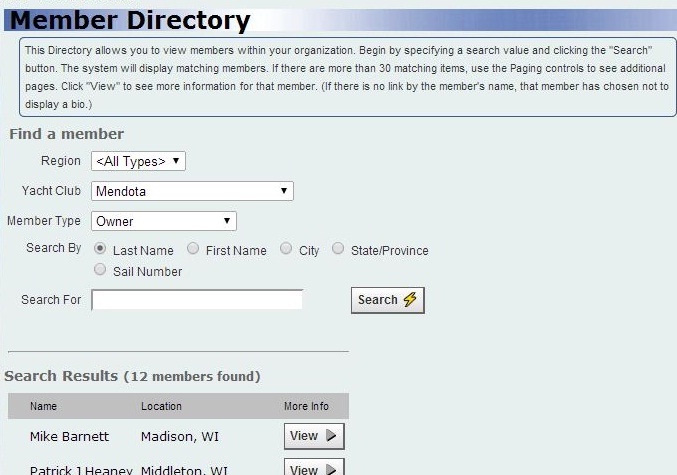 The Member Directory shows current members. All annual memberships expire at the end of February. However, I have set a grace period of two months so that members will continue to show in the Member Directory two months after their membership expires. If a member does NOT renew by the start of May - they will not be included in the Member Directory. Email notices have been sent to remind members it is time to renew your NCESA membership. The response has been good with 150 member renewals. Please renew your membership now so you remain in the Member Directory. When you access the website, login to see your red "renew" link.